Learn how you can decorate your home for the holidays in just 10 minutes with this beautiful Christmas centerpiece tray! I’ll show you step by step how to display your favorite Christmas ornaments in a pretty way where there is no Christmas tree required! This Christmas display is such a fabulous festive way to decorate your coffee table, foyer table, dining table or kitchen island in record time. 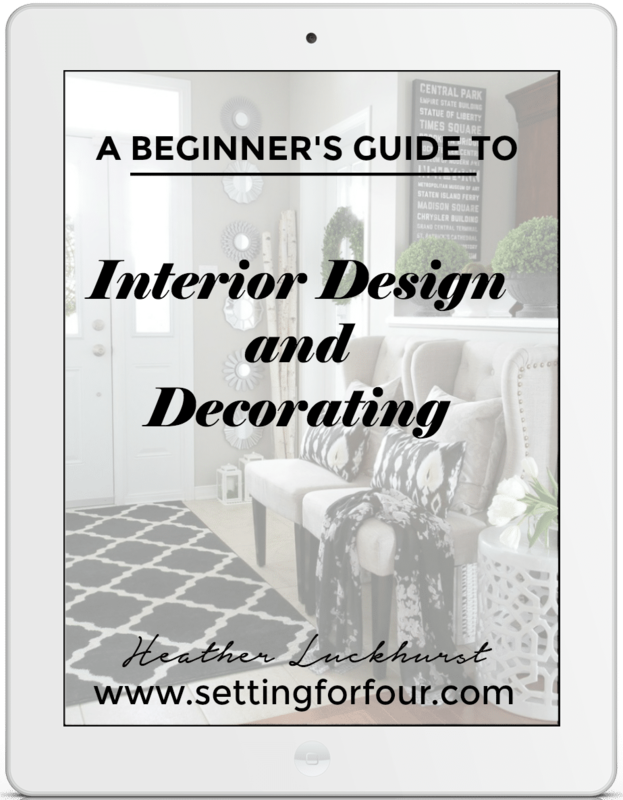 I’m sharing another 10 MINUTE DECORATING idea where each month my talented blogger friends and myself share some quick and easy ways to create a beautiful home in 10 minutes or less! Today’s 10 minute decorating lesson is the CHRISTMAS edition. 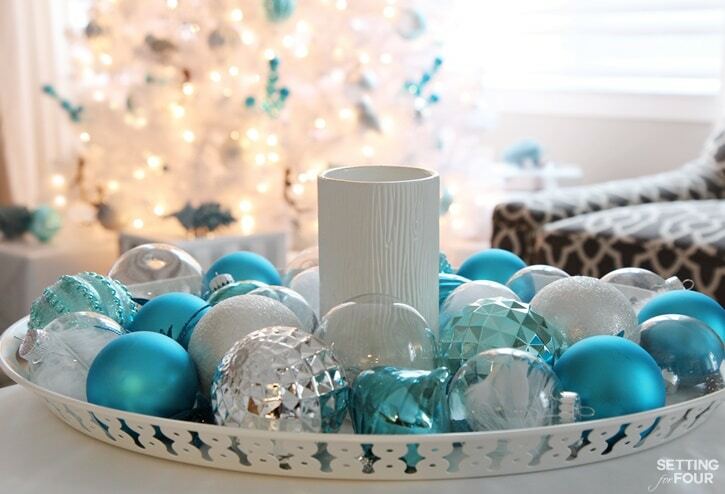 Today I’m showing you how to decorate a holiday centerpiece tray – it’s so simple and quick! Anyone can do this – really it’s that EASY, but completely guest worthy! Be sure to visit the blogs at the end of this post for more fabulous 10 MINUTE DECORATING ideas for Christmas! 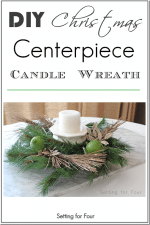 Here’s how to put together a quick and easy gorgeous 10 Minute Christmas Centerpiece Tray! Choose your favorite Christmas ornaments that you’d like to display. 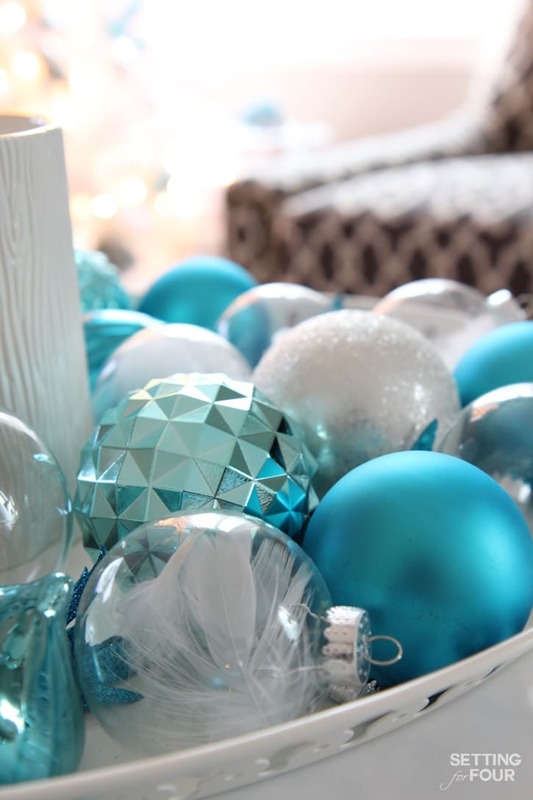 You can use ornaments that are the same but I like to mix up the shapes, sizes and colors to keep it interesting! My favorite ornaments are the ones I also used to decorate my winter woodland glam Christmas tree. 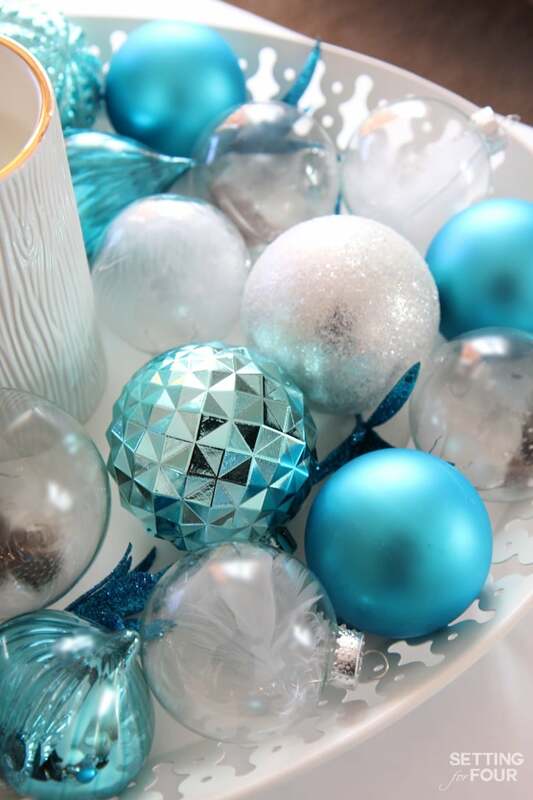 They are a combination of sparkly, matte and metallic finishes, snowy white, wintery blue and soft silvery gray. Ga-orgeous! 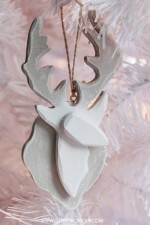 This is a great way to use antique or vintage ornaments that have been passed on to you or you’ve collected…. or ornaments you’ve collected on your travels! Once you’ve selected your ornaments choose a pillar candle and a tray. 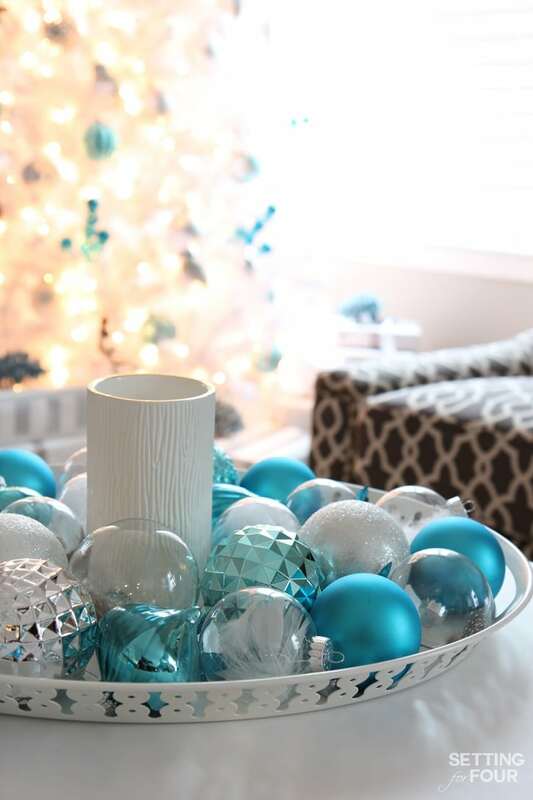 I love to use a large tray to display lots of Christmas ornaments, but you can use any tray you have on hand! This tray is from IKEA – isn’t it pretty?! I love the detail of the patterned sides! The beautiful pillar candle I used is the Frasier Fir candle from Thymes – it’s simple stunning in a faux bois ceramic holder and has an amazing fresh-cut forest scent of pine! So fitting for the holidays! I also added a sparkly blue leafy Christmas pick. I just cut off the leaves with wire snips to make mini leaf decorations. Once you have gathered your candle, tray and Christmas ornaments place the pillar candle in the middle of the tray and fill the tray with your ornaments! Light the candle and enjoy the cozy ambiance of shimmer and candlelight!! At night I love to cuddle up in my cozy reading spot with a mug of snowflake hot chocolate , listen to Bing Crosby’s “I’m Dreaming of a White Christmas” (my favorite holiday song!) and admire the reflection of twinkling Christmas tree lights shimmering on this elegant Christmas tray. 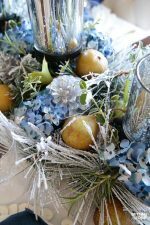 I hope you enjoyed my Christmas Centerpiece Tray idea and hope you make one to decorate your home! 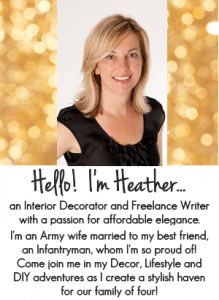 Please stop by these bloggers and see their inspirational 10 MINUTE DECORATING IDEAS! 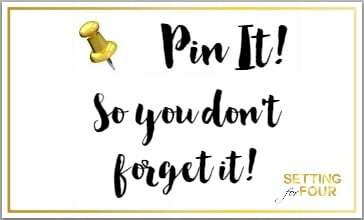 Don’t forget to pin this to your decor board or Holiday board! 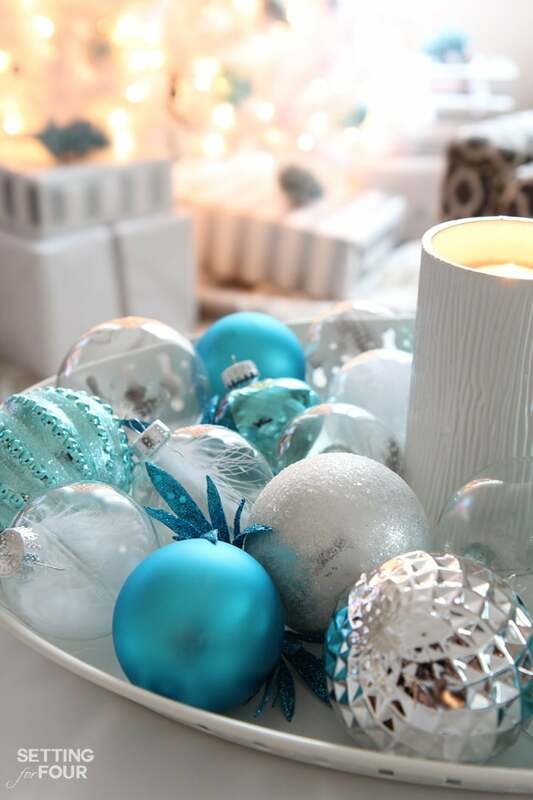 You can see the holiday decor I’m pinning here! Thanks so much Pili – glad you like my centerpiece!! I use a photo editing program to get rid of reflections….I use a ‘clone’ feature – it’s like an eraser and I sometimes also use a ‘blur’ feature to blur window reflections in my ornaments or anything made of glass. These features are available in just about any photo editing software program I believe! Hope that helps!!! 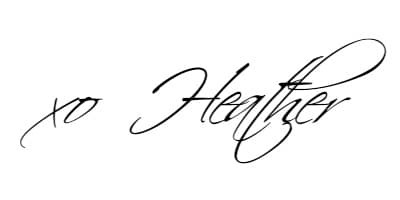 Super pretty Heather, lovely change from the traditional colors!! I’ve done the traditional red and white for so many years Susan, it’s a nice change to go with the blues! Happy Holidays friend! It’s SO pretty! LOVE the pops of colour Heather!!! 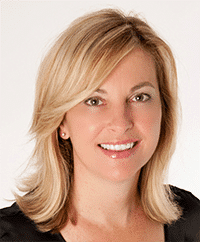 Thanks so much Kristi – Happy holidays friend! Heather I just drool over your style! Goodness, you are a fabulous decorator! 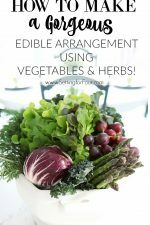 What a beautiful and easy-to-do arrangement. LOVE it! Merry Christmas! Well thanks so much Yvonne – so glad you like my centerpiece idea!! Happy Holidays my friend! Beautiful – thanks for sharing. When I click on the tray link, the candle pops up. What is the link for the tray – it sure is a beautiful tray. Happy Holidays to you and your family. Hope that helps and thank you for the lovely compliment!